Point2 Homes gives you far more than a simple list of houses for sale. Get instant access to a lot of relevant information about Cityplace, Toronto, ON real estate, including property descriptions, virtual tours, maps and photos. The search results pages also have a wealth of information on Cityplace, Toronto, ON, if you scroll all the way down. 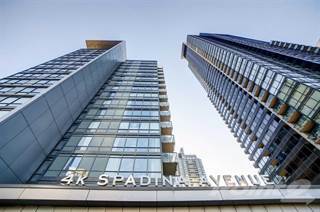 There are 213 houses for sale in Cityplace, Toronto, ON. 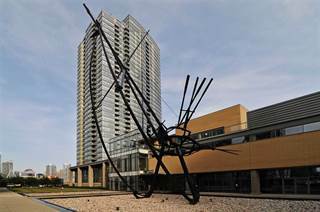 Searching homes for sale in Cityplace, Toronto, ON has never been more convenient. With Point2 Homes, you can easily browse through Cityplace, Toronto, ON single family homes for sale, townhomes, condos and commercial properties, and quickly get a general perspective of the real estate prices. Also, you’ll never miss a bargain if you filter listings based on house price drops in the past six months. Use the map view to find Cityplace, Toronto, ON homes and apartments for sale, based on amenities or city features that you may want close by. You can close in on a specific neighbourhood or area by simply drawing around them with the polygon or radius tools. Stay informed about the latest entries on the real estate market by saving your searches. This way, you get new listings in your inbox, daily or every week, based on your preferences. If you’d like to get in touch with a professional, agents are displayed next to their listings, and they’re easy to contact through the online forms. If you want more options, you can click the Tools tab and Find an Agent, and you’ll get a list of helpful and knowledgeable real estate agents in Cityplace, Toronto, ON. Visit the Point2 Homes blog and you can find up to date expert advice on many markets throughout Canada, regular market reports, neighbourhood scoops in cities throughout the provinces, real estate deals and useful recommendations. CityPlace exemplifies modern condo living in Toronto, Ontario. It is bordered by a famous landmark, is located in the heart of downtown and has sprung up in a very short period of time. For a city that has existed in some form for more than 200 years, CityPlace is a very new neighbourhood, and it is still going through a few growing pains as it nears completion. Cityplace is a veritable forest of new condo buildings. Front Street to the north, Lakeshore Boulevard to the south, and Bathurst Street to the west mark out the boundaries of CityPlace. The eastern edge is clearly marked by Rogers Centre. It is a relatively small neighbourhood, defined by the development itself. The development is part of the decades-long effort to reclaim the miles of old train-yards that once filled the Toronto waterfront. Although the condos are new, the area is rich with Toronto history. Canoe Landing Park opened in 2009. It features the “Red Canoe”, designed by Douglas Coupland, and is surrounded by the Miracle Mile, which celebrates Canadian icon Terry Fox. Rogers Centre (formerly “The Skydome”) is the most recognizable stadium in Canada, and stands in the shadow of the CN tower. The streets of CityPlace are filled with young urban up and comers. A mix of single professionals and young couples make their homes here, and the streets are filled with foot traffic at all hours of the day. The Puente de Luz Bridge is a famous local landmark that provides a way for foot and cycle traffic from CityPlace to easily reach Front Street. Although paid for by Concord Adex, the CityPlace developer, the bright-yellow bridge was designed by Francisco Gazitua, a well-regarded artist from Chile. Tourist traffic isn’t uncommon here either. Rogers Center and the proximity of the CN Tower mean that you’ll run into a great number of visitors to the GTA at the eastern edge of CityPlace. Despite the tourists, the number of people walking their dogs through the park let you know that many also call the area home. The locals walk to their downtown jobs, restaurants and attractions. Signs of urban living like a Starbucks or its equivalent on every corner, BikeShare racks, and droves of the suit-and-tie crowd coming to and from their meetings are the hallmarks of the neighbourhood. CityPlace is one of the best areas in the city to live for access to Entertainment. For sports lovers, Rogers Centre is home to the Blue Jays and the Argonauts. Air Canada Centre, home of the Maple Leafs and the Raptors, is only a few blocks beyond the eastern boundary of CityPlace. CityPlace is sometimes considered part of the larger “Entertainment District” of downtown Toronto. Some of Toronto’s best theatres are found within a short walk of the CityPlace condos. Factory Theatre and Theatre Pass Murraille are nearby, as are the Mirvish houses, The Royal Alexandra and the Princess of Wales. CityPlace itself is home to several chain-style coffee shops and restaurants, most of which are located on the shopping concourse levels of the condo developments. There are a few local standouts however. Mi-Ne Sushi is a favourite of the locals, and Hunter’s Landing provides a great hangout with a huge patio for post Jay game celebrations. CityPlace is essentially one gigantic condo development, and certainly the wrong place to come if you’re looking for a house. All of the residences in the area are condos. If condo living appeals to you though, you’ll find something in your budget and to your taste in this area. The prices in this area range quite a bit. Small bachelor suites in some of the more modest buildings are among the more affordable properties in the city. You can also find massive penthouse suites that have price tags seven figures long. Most of the available condos are bachelor, 1 or 2-bedroom suites, with a few large residences also available. Approximately half of the properties in the development are owned by investors and made available as rental properties. Many of the condo buildings look very similar, with several of the tall, glass buildings being indistinguishable from each other. There are a few architectural standouts in the area though, including the Parade condos. Two towers in this complex are joined by a “skywalk”. 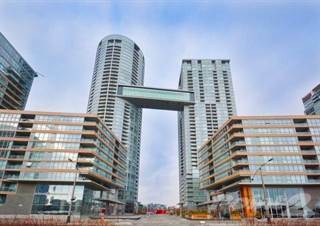 The bridge between the two towers is multi-level, with the top floor being occupied by two of the most prestigious residential suites in CityPlace. The bottom floor is home to a lounge that includes pool tables, a bar, and some of the best views in the city, all while being suspended 30 stories above the ground. The CityPlace neighbourhood has one of the highest assault rates in the GTA. It ranks 3rd out of all neighbourhoods in this category, according to this 2011 crime map. This is partially explained by the high density of tourist attractions nearby. The several streets in the surrounding area that are home to many bars and nightclubs may also play a part. In general, crime in the area is higher than much of the Greater Toronto Area. However, this is typical of the entire downtown, and not specific to CityPlace. Despite this, Toronto, including CityPlace, remains a very safe city. The Toronto Foundation’s Vital Signs Report once again confirmed that last year: Toronto had the lowest crime rate of all metropolitan areas in Canada. The development plan didn’t result in schools within CityPlace. However, ongoing discussions have been taking place regarding the viability of more schools in the area. There are a few schools in the nearby areas. The Waterfront School is just to the south of Lakshore, and accepts children up to Grade 8. To the northwest, St. Mary’s, an elementary Catholic school, provides a private schooling option. Just to the northeast is the Ogden public school. High school students have to venture further north, to Harbord Collegiate or Central Technical School. CityPlace residents have excellent access to public transit. Union Station, the primary hub for the TTC, is roughly a six-block walk past the eastern boundary of CityPlace. From Union, you can also board the GO transit system. This system ties together many of the GTA suburbs and much of southern Ontario. Streetcars are also accessible in the east and west ends of the neighbourhood, along Spadina and Bathurst respectively. Along the southern edge of CityPlace, you can board the 509 Harborfront streetcar. CityPlace is primarily a neighbourhood full of young people just buying their first home. The residences tend to be filled by singles or couples without children. The lack of schools in the area and the busy downtown lifestyle seems most appealing to people who haven’t yet started their families.